A stretch of 14th Street NW. The 14th Street NW corridor continues its transformation, as work on luxury condo buildings marches on and announcements of restaurant openings stream in. The older businesses that opened along the strip in the aftermath of the 1968 riots are, one-by-one, closing shop (and getting millions of dollars in exchange for their buildings, if they own them). Some newer businesses are moving, too. Development comes in waves, from pawn shops to fancier locally-owned businesses, and eventually, to chain retailers. That’s according to a few real estate experts interviewed by The New York Times, who say that 14th Street NW could eventually see its small, albiet upscale businesses, replaced by national chains and junior-sized box stores. One [resident], Tim Christensen, who has lived in the neighborhood since 1989 and is president of the Logan Circle Community Association, wondered about the cost. Gentrification does indeed come in waves. Some of the first businesses that contribute to the revitalization of a neighborhood can get priced out when turnover is complete. This is especially true for business owners who lease space and have no building to sell; they can become victims of the success they helped to create. 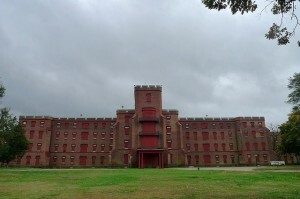 The west campus of St. Elizabeths in Southeast D.C. will be the site of the new U.S. Coast Guard headquarters. Neighborhoods east of the Anacostia River are undergoing changes, albeit they aren’t taking place as rapidly as west of the river. Higher-income folks slowly moving into east of the river communities, which are primarily low-income, are contributing to those changes. But massive development projects will likely have more of an immediate, and major, impact on the area. The office project is the first step in a long-term, transformational overhaul of downtown Anacostia being planned by a partnership between District-based Curtis Properties — which owns large chunks of land there — and Four Points, a D.C. developer that is making its name on projects in emerging neighborhoods. Such projects will bring many daytime office workers east of the river, people who want options for lunch and who may want to relocate to nearby neighborhoods to be close to work. Some are already bracing for the changes. The District’s Department of Transportation has plans to expand D.C. Circulator to roll past St. Elizabeths Campus in the next few years. 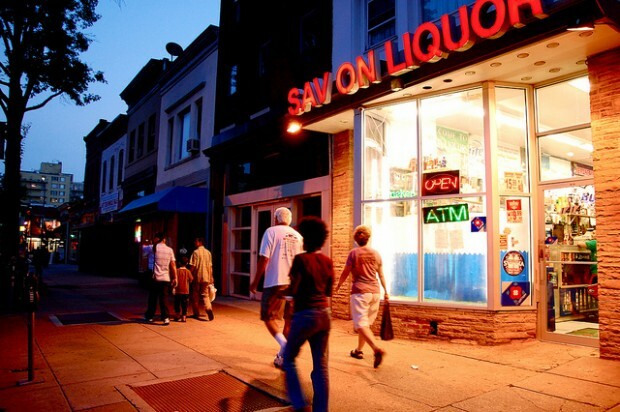 The neighborhood from its earliest days was very strongly African-American, as a result of a number of Union army camps that were located here to accommodate what were called “contraband,” or escaped slaves, or former slaves that had managed to make their way to the District of Columbia. … We had schools, churches, hospitals, a university, all established and constructed in close proximity to be able to serve that large African-American population. 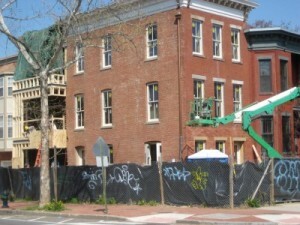 This historic building in Shaw is among many that are being renovated and reconstructed in the neighborhood. Listen to the entire segment, as Padro and others explain what happened to Shaw after housing laws changed, the 1968 riots and the new convention center was built where parking lots and dilapidated buildings once sat. In the latest Census, the U Street corridor reported no longer having a majority black population, and Shaw now has a number of luxury housing options. Now add this to the mix: a major development at 9th and O Streets, NW just cleared a major hurdle. The Department of Housing and Urban Development recently approved a $117 million loan for CityMarket at O, a major retail and housing project featuring a Giant, luxury and market rate housing and a Wolfgang Puck restaurant. How much more will Shaw change?